This study of Louis XIV (1638-1715) was drawn from life when the king was aged 25 and had been suffering from scarlet fever. 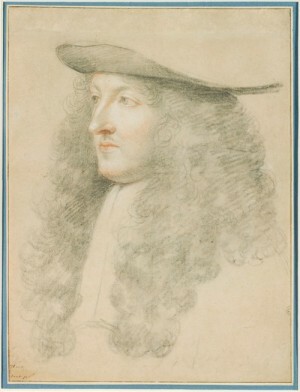 Le Brun was particularly interested in how a person’s face could reveal their personality. Here the King is depicted as youthful and intelligent. 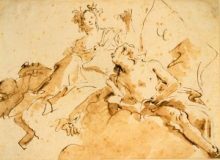 This drawing was probably used for a tapestry in a series entitled L’Histoire du Roi (History of the King), which was produced between 1662 and 1673 at the Gobelins manufactory in Paris.